So I have this ukulele. The ukulele has always been my favorite object of playful ridicule, which I’m slightly ashamed to admit since my family is from Hawaii. It’s not that I hate the ukulele, mind you. It’s not, like, how I’m an Arizonan who hates the Kokopelli with a mad, burning passion. (True story. I cannot stand the sight of the Kokopelli.) I just find the ukulele to be hilarious. It cracks me up, and it always has. I don’t know. I can’t explain myself. Q: What’s the difference between a ukulele and a trampoline? A: People take off their shoes to jump up and down on a trampoline. Q: What is “perfect pitch”? A: When you throw the ukulele into the garbage can without hitting the rim. Q: What do you call a beautiful woman on a ukulele player’s arm? A ukulele player suddenly realizes he left his vintage ukulele out in his car overnight. He rushes outside and his heart drops when he sees that his car window is broken. Fearing the worst, he peeks through the window and finds that there are now five ukuleles in his car. I used to enjoy telling my family ukulele jokes like these, until I realized one day that no one was laughing at them but me. In fact, they weren’t amused, at all. They’re from Hawaii, and they take their ukes seriously. Then, at some point in the last 15 years, I think, the ukulele suddenly got a foothold in the Indie crowd. Inexplicably, the uke love pulses on in popular culture today. The ukulele managed to assert itself in random places, from the Arrested Development theme music of the 2000’s to the Bob’s Burgers theme music of present day. I hear it all the time on YouTube. (Garfunkel & Oates, anyone?) It’s like the ukulele spawned and sent its babies from the islands to branch out like a chain of sandwich restaurants across the U.S., and now it’s the quirky and hip answer to the jazz club xylophone of the 1930’s and all the cool kids love it. It’s become a part of our cultural acoustic landscape. Okay, whatever. I didn’t begrudge anyone their love of the ukulele when this, um, evolution took place. I still enjoyed ukulele jokes. BUT THEN. One day, Mom told me she was doing some research so she could make an educated choice. She was excitedly preparing to undertake a new hobby. She was going to honor the roots of her Hawaiian upbringing. She was going to buy…. Yep. 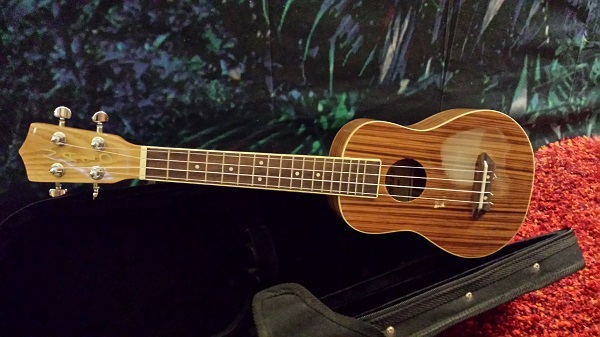 A ukulele. I didn’t laugh when she told me this, because first and foremost, I thought it was awesome that Mom was planning to learn an instrument. Also, her choice of instrument made perfect sense. She was reclaiming her cultural roots in the islands, and I was happy for her. I cheered as she selected and bought her ukulele and found herself an instructor. She got her instrument and her instructor and lessons and everything all in Hawaii (my parents live there half the year). Fast forward two years. Mom had set the ukulele down after several months of lessons, because life happened. Life picked her up and carried her down a stream to a place that did not include playing the ukulele. The ukulele was collecting dust. When we were up there in the Yay Area (NorCal) this last Thanksgiving, she said to me, “Kris, do you want my ukulele? You’re the musical one in the family, and I don’t want to just give it to anyone!” I understood. The ukulele held great sentimental value for her, and it had been expensive… and, well, what could I do? I had never been interested in learning the ukulele, but this was a no-brainer! I couldn’t reject it, this ukulele that had meant something to Mom, and that she was now offering to me. It held sentimental value. It was special. And besides, it was lonely. I couldn’t very well leave behind an abandoned ukulele, now, could I? Such as it was that I, a lifelong believer that the ukulele and the xylophone are tied at first-place for Most Hilarious Instrument, wound up driving from San Jose to Phoenix with a ukulele in the back seat of the car. I’m now in possession of a ukulele. It’s sitting right here next to my desk, snug in its case, along with the book of lesson sheets Mom also gave me. Furthermore, I’ve resolved to learn it, because why should the poor ukulele go from collecting dust in California to collecting dust in (way dustier) Arizona? Looking at the instrument, I have to admit that it’s a beautiful specimen of ukulele. Mom really did her research! The ukulele that came home with us. It says something on the end: NALO. Is that its name? Or is it the brand? I don’t even know. I don’t know anything about ukuleles, except for bad jokes. ← Long-Overdue Yoga Fix Ahead! Hmm… I like your idea! If I was a zebra (or a zebra wood something), what would I be named? I’m afraid the ukulele’s case is getting a bit dusty. I do intend to pick it up one day, though! Do you play yours a lot? I recently traveled to Maui and got the bug, but did not want to make a rash purchase. A few weeks later I searched Craigslist and found a NALO uk at a pawn shop in south Austin. It looks just like yours; a quality piece of work. In trying to find info on the where and who, I came across your lovely blog. I know this is an old string, but have you picked it up? If not, I found a good online instructor named James Hill; The Ukulele Way. The cost US is $7.00 a month(9.00 CAD). I find it to be very good beginner to professional instruction. He has several free classes to get the vibe. Thanks for the jokes, I plan to use them.